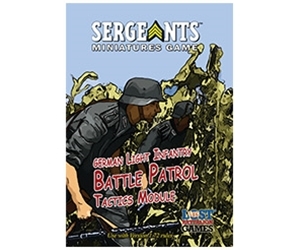 The German Light Infantry Battle Patrol Tactics Module adds team oriented tactics and abilities to your Light Infantry troops. Featuring specialized Tactics cards that allow teams of men to perform maneuvers as a cohesive unit with new React, Preempt and Commands cards. Also featuring a Tactics panel specialized for the dreaded MG42, this Tactics module will certainly give your German force fire superiority.